The NHS is based upon the principle of equity of access – that every patient should have access to high-quality healthcare – but evidence and research suggests that those living with disabilities can often be disadvantaged. Those with physical disabilities may have difficulty in accessing primary care, struggling in poorly-designed buildings that haven’t been adapted to accommodate their individual requirements. Practices have a legal duty under disability + equality Acts and BS 8300 Design of an Accessible and Inclusive Built Environment (guidance) to ensure that their facilities are accessible for those with all physical impairments. Updated in July 2018, the guidelines are clear that practices should be accessible for everyone – including those with limited mobility, those with visual impairment and hearing difficulties, and those with mental health conditions or cognitive problems. Where access is compromised, practices should take reasonable actions – as defined within the acts to obviate or mitigate the impact on patients. When considering accessibility it’s important to focus on the individual needs, says architect Ian R Goodenough. A partner at healthcare specialists G2 Architects, Ian and his team have designed award-winning modern and accessible practices across the south west. He says you need to think about how the building works as a whole. So, what works and what doesn’t in your building? A simple survey asking your patients what they think would provide some interesting and relevant food for thought. Another useful tool to identify accessibility concerns is role-play. Imagine you live with a disability of some sort – how would you navigate through the building? Role-playing activity needs to recognise different users and their needs relating to the design of the physical aspects of the premises and the activities that are carried out within it. Practice managers may not be the best people to carry out this role, given their familiarity with the facilities. Rather, it is often easier for an outsider to approach this as they come to a building afresh and are able to objectively review the environment, reacting to what is in front of them with no prior knowledge. Typically, when we speak about access for those with disabilities, people think about those in wheelchairs. However, while access for wheelchairs is essential, accessibility isn’t just about stairs and ramps. Ian considers the whole range of challenges when developing and improving practices. Here are some common disabilities – and some potential solutions. Reduced mobility: includes wheelchair-users, as well as people using crutches/sticks/frames and those with restricted reach or dexterity. 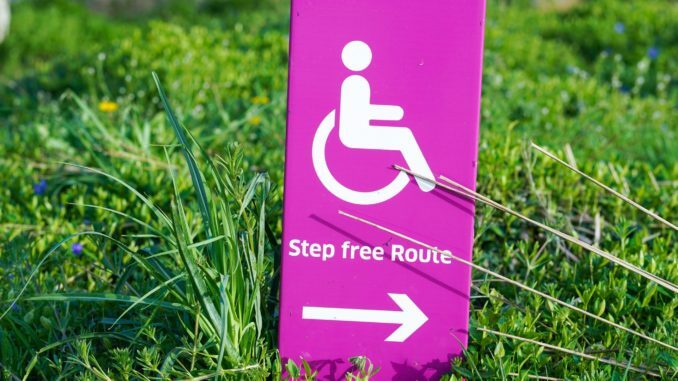 Access for these users can be improved by providing unobstructed routes, wide footpaths and corridors (where possible) and level access and ramps. Low level counters, clear signage and usable controls (fixtures and fittings that can be operated by those with mobility issues) are positive enhancements. Visual impairments: includes those who are blind or partially sighted. Ian recommends that way-finding should be clear and, if complicated, effort should be made to simplify things. Signs should use visual contrast, in line with the NHS accessibility guidelines. In new buildings Ian suggests considering the use of both soft and hard flooring to distinguish between seating and circulation in the same space and the introduction of new lighting technology to support those with sight issues. Buildings should have good lighting that aids lip reading, Ian says. Appropriate technology – like hearing loops – should be installed and regularly checked and maintained. Clear, simple signage and uncluttered access routes can also be beneficial. Cognitive impairment: includes conditions like dementia. Clear and logical way-finding is important; patients should flow through the building, with destinations and/or decision points clearly visible Ian reiterates his recommendation that signs include simple, recognisable icons. The surgery environment should be uncluttered and relaxed. If possible, there should be quiet space provided for those who may be upset or anxious, and clear, simple and logical navigation and signage provided to ease access. If you identify issues with your building that can be changed, you should make all reasonable adjustments to accommodate those with disabilities. Staff should receive training relevant to the adjustments, including how to use assistive technologies like hearing loops. The process of learning is continual, Ian says, and recommends that practices regularly review the effectiveness of their adjustments and act on the findings as part of a continuing and evolving duty to providing high quality care. Ian’s approach is not to single out an individual condition or cohort – but rather to make the building and its immediate surroundings as accessible as possible to all. The focus is on making way-finding a natural movement and progression through the grounds and the building. Building should be easy to navigate with minimal reliance upon signage, reducing stress and the need for patient supervision or rescue when they get lost, says Ian. He operates on the principle that buildings should be as simple as possible to move around, believing that ease of navigation benefits everyone who uses the practice – not just those with disabilities. All practices would benefit from adopting this perspective. Ian R Goodenough is a partner at G2 Architects.